Ever wonder where the word ‘Britain’ comes from? It originated with Brigit of the Fae, whose name the Romans, for reasons best known to themselves, combined with that of another indigenous spirit, Ana, to create Britannia. They changed her sun disc into a shield and her wand into a sword, and thus almost managed to emasculate the true spirit of these isles. I say ‘almost’ because they didn’t succeed. The spirit of Brigit is beginning to burn bright again as more and more people search to uncover their spiritual roots. In fact, Brigit is the key to one of the most ancient initiations into the Underworld going back many thousands of years … but more about that later. I only mention it now in order to signal that although I will be explaining the origins of Brigit, and going into some of the ancient customs associated with her, this is not going to be one of those dry, dusty, fusty essays about folklore that don’t lead anywhere. I leave all that to the folk historians. I’m not the least bit interested in folk songs or Morris dancing or corn dollies or May poles unless I can trace the magical, transformative seed underneath — the catalytic spark that creates change through magical or shamanic initiation. There is a very good reason for all that Morris dancing and singing of ballads, but that’s the bit most folk historians leave out. First of all, who was Brigit? And where does she come from? The Celts shared many sacred ritual practises with the ancient Vedic Indians. They migrated from across and through the Himalayan region after the last Ice Age, eventually arriving in Europe. The Brigantes were among them. Before becoming the largest Celtic tribe in the British Isles, the Brigantes had settled in Austria near Lake Constance in a place known as Bregenz. They had fire priests known as bhrisingrs after the bhrigus or fire priests of the Anu tribes. Brittany in northern France was also named for Brigit, and she was also the inspiration for Brechin in Scotland, the river Brent in England, the river Braint in Wales, and Bridewell ~ both in London and in Ireland. The city of Bristol takes its name from Brigit. And Brenin, the Welsh word for King, meant consort of Brigantia. 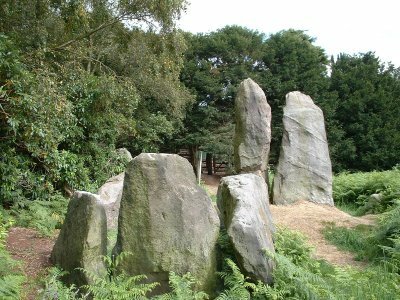 There are also the Bridestones, a Megalithic site on the outskirts of Congleton in Cheshire. These stones are thought to be more than 4,000 years old. 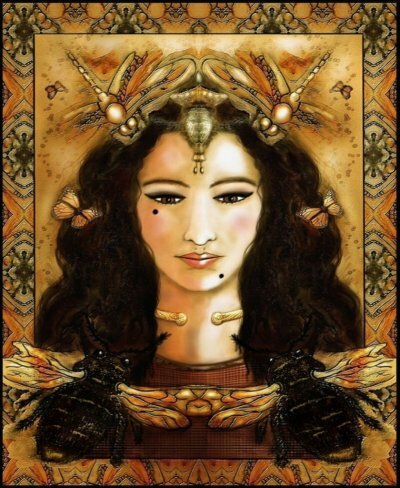 In Celtic mythology, Brigit appears as one of the offspring of the Dagda and the Morrigen, (about whom you can read more in The Underworld Initiation of King Arthur by Morgan the Fae.) She was part of the Tuatha da Danaan, which is another name for the Sidhe, the Fae, the Little People or the Gentry. Brigit was known as the patron spirit of healers, smiths and bards, and she rules the elements of fire and water. Brigid’s Feast Day is on Imbolc in February, which the Christians call Candlemass. On Imbolc, milk products are offered to her as the young Bride. Butter, cheese and milk are put out for her. People say that Bride herself is abroad on Imbolc Eve. So they leave out pieces of cloth for her to bless as she passes, and which are used later in healings. One of her symbols is the serpent entwined around a white wand, predating Asclepius. Other important animals associated with Brigit are the white swan, the white wolf and the white cow. 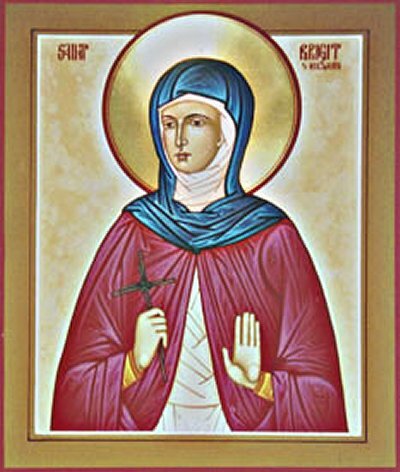 The Romans Christians, as was their wont, found a way to amalgamate Brigit into the Christian religion by adding her to their pantheon of saints. Her centre was at Kildare in Ireland. “Cill Dare” means “Church of the Oak”, thus betraying its Druid past, and it was in an area known as Civitas Brigitae, “The City of Brigid”. 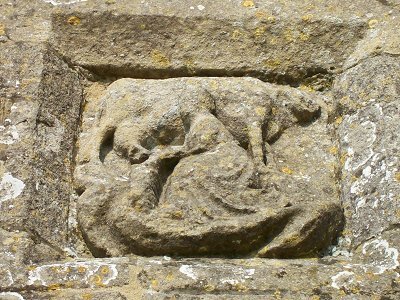 Brigit is found in this carving within a wall of what remains of the St Michael church on top of Glastonbury Tor, milking a cow. In this way, even within the Christian pantheon, she retains her association with her primary totem animal. Because Celtic Christianity retained many of the indigenous spiritual practises, Brigit’s fire was kept alight day and night at the Kildare convent, by dedicated vestal priestesses, for centuries — until they were finally put out by Henry VIII’s shock troops of the Reformation. I’ve been getting to know the kind and gentle spirit of Brigit in recent times, and have been honoured to receive her initiation. She has taught me to follow her in an ancient route through the Underworld which, although well-trodden, is not so well used today, since the advent of the Western Mystery Tradition with its pathworking up the Kabbalah or Qabalah. This way in which Brigit guided me is a much more ancient route. It bypasses the Abyss of the Kabbalah, with all its perils and pitfalls, by travelling underneath it. The Way of Brigit is part of a magical working known as The Mask of the Bright One, and it has also been called The Harrowing*. * I’m grateful to R.J. Stewart for providing some of the material for this journey. Hi there Annie. Thank you for this very insightful and well-informed post. I learned a whole lot more about the ancient traditions of the British Isles. I read an article recently that also traced some Irish ancestry through DNA back to the middle-east. I’m a Shamanic practitioner too, working with a mixture of pagan and Buddhist techniques. You might be interested in this post of mine. Fascinating as usual. I read a book once “Proof of Vedic Culture in Modern Society” May have it wrong and sorry I have forgotten the authors name. What fascinated me was the language such as Scandnavia meaning Shivas Navy. It meant the people there are also descendants of the original people from Indus and Im not sure how it happened that they are fair. I have met Brigit. I am fascinated with the ties with people and language. My time on earth is not long enough to learn all I want to 🙂 My grandmother was named Blanche, also meaning white. I think it strange because she was very dark, black eyes, black hair and dark skin. And thanks for the reminder about Stephen Knapp 🙂 I loved reading it. Lots of triggers and new insights for me. ‘Britain’ is from the old Celtic word meaning ‘blue people.’ It was actually the ‘Pritanni’ but Roman writers mistook the pronunciation for ‘Britanni.’ Hence, the name has nothing to do with Brigit. That’s just the start of the wrong information you present here. Brigit is definitely not amused by such things. Very beautiful. I see traces of the same sacredness of the cow in Brigid, shared with the Vedic people. This would date back to the common heritage. Cavilli-Sforza used linguistic dating to estimate the separation of the Celtic and most other European languages from the Indo roots as happening about 7,000 years ago. So the cow has been sacred at least that long. The word for cow in Chorti clearly is a new word coming from the Spanish since there were no prior cows in western Hemisphere. However, one possible root, much older, is “bok” which mean ‘pulling up’ and “ah-bok” means ‘animal that pulls up’. It can be dangerous to walk between cows since they easily spook. So beautifully written. I feel deeply connected with Brigit ~ as do so many ~ and I wish that I could be a part of this magical workshop in Glastonbury. (sigh) … Well, perhaps in spirit.